Random House presents the unabridged downloadable audiobook edition of Butcher, Blacksmith, Acrobat, Sweep by Peter Cossins, read by Joseph Kloska. Full of adventure, mishaps and audacious attempts at cheating, the first Tour de France in 1903 was a colourful affair. Its riders included characters like Maurice "The White Bulldog" Garin, an Italian-born Frenchman whose parents were said to have swapped him for a round of cheese in order to smuggle him into France as a 14 year old, Hippolyte Aucouturier, who with his jersey of horizontal stripes and handlebar moustache looked like the villain from a Buster Keaton movie and amateurs like Jean Dargassies, a blacksmith who had no idea what he was letting himself in for. Dreamed up to revive a struggling newspaper, cyclists of the time weren't enthusiastic about this 'heroic' race through roads more suited to hooves than wheels, with bikes weighing up to twenty kilos, on a single fixed gear, for three full weeks. Assembling enough riders for the race meant paying unemployed amateurs from the suburbs of Paris, including a butcher, a chimney sweep and a circus acrobat. There was no indication that this ramshackle cycling pack would draw crowds to throng France's rutted roads and cheer the first Tour heroes. But they did, and all thanks to a marketing ruse, cycling would never be the same again. 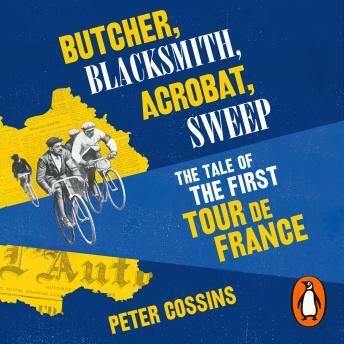 Acclaimed cycling writer Peter Cossins takes us through the inaugural Tour de France stage by stage to see where the greatest sporting event of all began.